Looking for Landscape Rock in Billings MT? Natural rocks are one of the most available and versatile resources that you can find when it comes time to give your yard a landscape makeover and it landscape rock provides great landscaping benefits to your property. Landscape rock is easy to find and can add color, texture, and contrast to your yard. They also serve as a very durable ground cover and even better, they require little to no maintenance. With a little creativity and a little time, anyone can utilize natural rocks to landscape a yard to great results. The first thing you want to look at is choosing the right rocks for your landscape. Which rocks you use, will basically set the tone for your entire yard or garden area. River rocks are often used to add warmth to an area, which rocks like white marble are used to brighten up a shady area. Black lava landscape rocks are excellent for a Polynesian type theme and terracotta stones will give an area a more tropical feel. There are endless amounts of pictures to be found online that will show you examples of what each type of rock can look like when used to landscape a yard. You want to choose the rocks and stones that best suit you and your yard because they will last for a very long time. Take your time when picking out the best stones for your landscape. Rocks are also used to replace mulch. They are more expensive than mulch, but they also provide much better groundcover. With mulch, you will need to replace it every single season. By using rocks you are replacing it with something that will last indefinitely. You can basically get a lifetime of use out of rocks in your garden. Another advantage of using landscaping rocks over mulch is that they provide a nice color contrast and will brighten an otherwise shady area. You can use rocks in the corners of your landscape just to bring more light to those areas. They can also be used to call attention or highlight a beautiful shrub or plant. The stones can be used to create a living sculpture of sorts and they will also discourage weed growth in the areas that they are employed. For best results you should install a weed barrier before laying down the rocks. Planting a rock garden is a favorite way to add a more exotic look to your landscape. An easy technique is to choose an area that gets plenty of light and install several small boulders. You then surround the boulders with flowers that lie low to the ground such as ground orchids, cactus or portulaca. Then fill in the gaps with smaller stones that add color and accentuate the larger boulders. There are many ways to vary this simple process and you can get very creative when planting a rock garden in your yard. Another eye-catching way to use landscape rocks to landscape your yard is to creative a centerpiece. 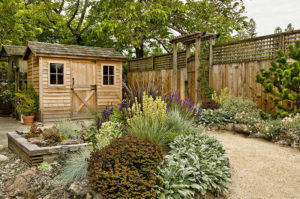 You generally want to use something tidy and low maintenance, as using an ornamental shrub can result in it growing too much and becoming unruly. In larger rock gardens, the use of a centerpiece can help bring some life to areas that are otherwise a bit monotonous. Usually border areas or hedges are a good place to consider doing a centerpiece type design. You can use some imagination and incorporate it into pretty much any part of your yard with a little effort. Large rocks are also many times used to create a nice border around ponds. The right type of rock can serve to camouflage things like pond liners and using bigger ones can give your pond a fairy tale type feel. Try to avoid using things like rectangular paving stones in these instances, and instead use rocks that give a more natural effect. Rocks that are similar in size, but yet different in color and shape are a great way to make a pond border look perfectly natural. Creating a low maintenance container garden is another great way to utilize rocks in your landscaping. You can put these type of containers within reach of your sprinkler system rather than being on your patio or porch, so that they don’t need constant watering. You then line the container with weed barrier and set the plant containers on top of it. Cut holes in the barrier so the bottom of the pots can fit through and provide adequate drainage and so they can settle into the soil. After completing this step, surround the pots with small stones and use different colored ones to complement the color of the plants. The end result is an eye-catching garden container that you don’t have to water because your sprinkler system will take care of the maintenance for you. Making a stepping stone path is another favorite way to incorporate rocks into your landscape. Stepping stone paths make for very picturesque ways to enlighten those shady areas around the edges of your yard. Paths also make for a great practical way to keep your shoes clean when walking out to your garden or various parts of your yard. 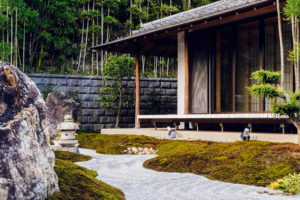 There are endless ways you can vary stone walking paths, but a great one is to surround the larger stones with smaller pebbles in a contrasting color. No matter how you do a stepping stone path, it will always serve to highlight that area of your yard. To get help, or answers to any questions you have about landscape rock in Billings, MT, give Landscaping by Allen a call today at (406) 861-5365.